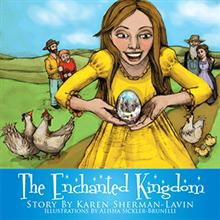 Karen Sherman-Lavin crafts a delightful picture book that follows a young girl’s dream to live in “The Enchanted Kingdom” (published by Xlibris). This absorbing parable emphasizes the importance of hard work, love and compassion for others as a necessity in achieving one’s dreams. Accompanied with colorful illustrations and a charming narrative, readers follow the young and energetic Molina, a peasant child who aspires to live in a magical, wondrous kingdom. She later meets a traveler named Jean Paul outside her village and their friendship blossoms into something innocent, pure and righteous. This fantastic tale reveals how love, compassion and self-sacrifice can overcome any obstacle. Magnetic, heartfelt and highly imaginative, “The Enchanted Kingdom” is a captivating story book laced with essential moral lessons that show how goodness can be rewarded in many different ways. Karen Sherman-Lavin is a native to Houston, Texas and is currently living in South Florida. She is a PGA golf professional who enjoys working with children.